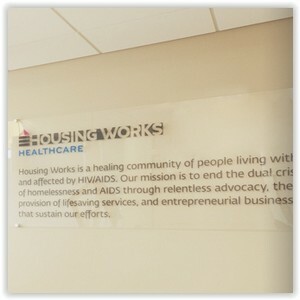 Housing Works is committed to ending the twin crises of AIDS and homelessness. We are renowned for addressing the needs of people living with AIDS that other organizations deem “too challenging to serve”. By offering a comprehensive array of health, housing, AIDS prevention, legal and case management services, we help our clients to empower themselves and actively manage their HIV. Through our advocacy offices in New York City, Albany, Washington D.C., Mississippi and abroad in Haiti and Puerto Rico, Housing Works fights for funding and legislation to ensure that all people living with HIV/AIDS have access to quality housing, healthcare, HIV prevention information and other life-sustaining services, as well as legal protections from stigma and discrimination. Housing Works is a grassroots organization committed to the use of non-violent civil disobedience in order to further our mission to end AIDS and homelessness.